Outdoor activities, culinary activities, games and so much more in honor of our cuddly pals. Adorable word flashcards, garlands, coloring pages, lacing activities, activity sheets, and crafts plus a new teddy bear rhyme! 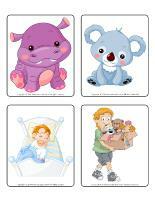 (Open thematic poster-Stuffed animals) Print, laminate, and decorate the walls of your daycare with all kinds of posters. (Open educa-theme-Stuffed animals) Print and laminate the document. The illustrations can be used to present the theme to children (and their parents) while decorating an area within your daycare. (Open educa-decorate-Stuffed animals) Print, laminate, and cut out the various items. Use them to decorate your daycare and set the mood for the theme. 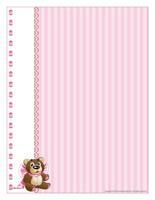 (Open garland-Stuffed animals) Print the illustrations. Let children decorate them. Cut them out and hang them within your daycare or near your daycare entrance to create a garland. 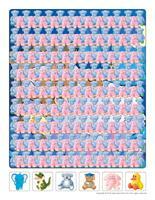 (Open educa-numbers-Bears) Print and laminate the posters. Display them on a wall to decorate your daycare throughout the theme. 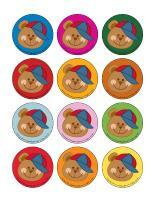 (Open educa-letters-Bears) Print and laminate the posters. Display them on a wall to decorate your daycare throughout the theme. (Open garland-Bears) Print the illustrations. Let children decorate them. Cut them out and hang them within your daycare or near your daycare entrance to create a garland. This special tool was created in response to a special request received. 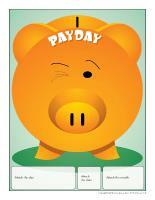 (Open perpetual calendar-Payday) Print and laminate. Display in a specific area within your daycare. Invite children to bring their favorite stuffed animal to daycare. They can present their stuffed animal to the group and keep it by their side at naptime. Deposit a large container filled with stuffed animals in the centre of your daycare before children arrive in the morning. Let children explore the contents of the bin. Hide stuffed animals throughout your daycare. Children will enjoy discovering them as they play during the day. The pictures may be used as a memory game or to spark a conversation with your group. Use them to decorate the daycare or a specific thematic corner. 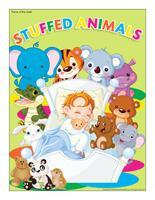 (Open picture game-Stuffed animals) Print, laminate, and store in a Ziploc bag or in your thematic bins. 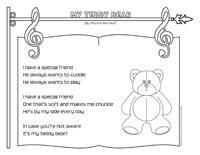 (Open activity sheets-Stuffed animals) Print for each child and follow instructions. 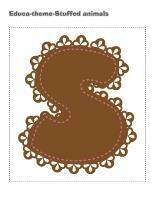 (Open writing activities-S like stuffed animal) Print for each child or laminate for use with a dry-erase marker. (Open stationery-Stuffed animals) Use this thematic stationery to communicate with parents, in your writing area, or to identify your thematic bins. Print. (Open game-This is my spot-Stuffed animals) Print two copies of each illustration. Use adhesive paper to stick one copy of each illustration on the table. Place the second copy in a bag. Children take turns picking an illustration to determine where they must sit at the table. You may also use the illustrations to determine children's naptime spots or their place in the task train. (Open my stuffed animal path) Print, laminate, and secure the illustrations on the floor of your daycare to create a path leading to the areas frequently visited by children throughout the day. The path can lead to the bathroom, the cloakroom, etc. If you prefer, use the illustrations to delimit various areas. 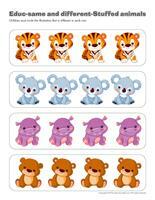 (Open lacing-Polar animals) Print, laminate, and cut out the models. Punch holes around the contour of each model. Provide shoelaces or pieces of yarn children can thread through the holes. Divide your group into two teams and draw a line on the floor (using electrical tape) to divide your daycare into two equal areas. Give each team an equal number of stuffed animals. When you give them the signal, children must throw the stuffed animals as quickly as possible into the other team's territory. The winning team will be the team that has the least stuffed animals in its territory when the time is up. This is a great indoor activity for when children cannot run around outside, on very cold or rainy days for example. (Open sorting sheet-Colors) Print and laminate the sheet. Provide children with colourful gummy bears. Encourage them to gently manipulate them between their thumb and index finger and associate them to the correct color. This exercise is great for developing fine motor skills. Of course, reward children by letting them eat a few gummy bears at the end of the activity. Variation: If you have some, you can also use tiny plastic bears. You will need several small stuffed animals as well as a few containers (storage bins, garbage cans, plastic bowls, etc.). Arrange the containers a few feet (or more) from a line drawn on the floor using electrical tape. Have children stand on the line and try to toss the stuffed animals into the containers, much like a bean bag toss. A few minutes before naptime, divide your group into pairs. Have them massage their partner's back using a stuffed animal. You will need two strollers for this activity. Sit a stuffed animal in each stroller. Use chalk or cones to outline a course in your backyard and encourage children to push the stroller along the course as quickly as possible. Use a stopwatch to time children and see who completes the course fastest. Variation: If you do not have strollers, have children complete the course with the stuffed animals in their arms or in backpacks. Deposit several stuffed animals on a parachute or blanket. With children's help, send the stuffed animals flying through the air simply by bouncing the parachute/blanket. Children will surely want to repeat this activity over and over again. Encourage children to count together while you hide several stuffed animals throughout the yard. When you give the signal, they must search for the stuffed animals. When they find a stuffed animal, they must hide with it. When there is only one child left, invite him/her to hide the stuffed animals for the next round. Variation: If you prefer, simply have children search for the stuffed animals. (Open educ-trace-Stuffed animals) Print for each child. Children must trace the dotted lines using the corresponding colors and then color the objects. (Open educa-symmetry-Stuffed animals) Print. Have children color the bottom picture to make it look exactly like the top picture. (Open educ-intruder-Stuffed animals) Print and laminate. Children must find the six items hidden in the scene. 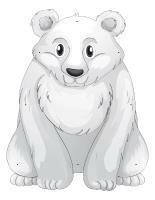 (Open educ-same and different-Stuffed animals) Print and laminate for durable, eco-friendly use. Children must circle the illustration that is different in each row. (Open dress-up dolls-Stuffed animals) Print and laminate. Leave the pieces out. Children will enjoy dressing the doll many different ways. How are stuffed animals made? Purchase several old stuffed animals in garage sales. Present them to your group for this activity. Allow children to manipulate them for a while. Unsew the seams of a few stuffed animals and show children what is inside. Let them manipulate the stuffing. Are all stuffed animals filled with the same type of material? What does the stuffing look like? What happens when we remove all the stuffing from a stuffed animal? (Open educ-poster-Honey) Print and laminate the posters and use them to present the food item to your group. The posters will make it possible for children to discover different forms of everyday food items. Display them near the table where children eat or in your kitchen area. With your group, prepare 2 or 3 recipes of blue Jell-O and divide the mixture among small bowls. You must have one bowl per child. Set the bowls in the refrigerator. After a few hours, deposit a few gummy bears on top of the Jell-O in each bowl, pushing them in the preparation so their legs sink into the Jell-O. At snack time, children will enjoy saving the little bears from drowning by eating them up! At snack time, serve bear-shaped cookies and milk. Make your own or use store-bought cookies. Give each child a plain rice cake and have them spread chocolate cream cheese on it. Add miniature pretzels to represent ears and candy pieces for the eyes, nose, and mouth. Variation: You may use English muffins instead of rice cakes. (Open puppets-Stuffed animals) Print the models on heavy cardboard. Have children cut them out and decorate them with a variety of materials. Glue a Popsicle stick behind each model to create puppets. (Open models-Stuffed animals) Print the models and use them for various crafts and activities throughout the theme. 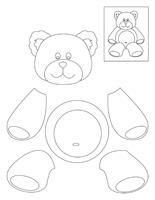 (Open my miniature teddy bear) Print, color, and cut out the teddy bear parts. Glue them on an empty toilet paper roll to create an adorable teddy bear. Hang from the ceiling. (Open mandalas-Stuffed animals) Print for each child. Encourage children to color the mandalas when you feel they need a calm activity. (Open models-stuffed animals) Print the model you prefer. Have children trace the outline of the model with white or clear glue. When they are done, sprinkle ground coffee (just like you would normally do with glitter). Shake any excess coffee off over a garbage can and display on a wall once the glue is dry. (Open stencils-Bears) Print and cut out the different stencils. Encourage children to use them to trace or paint items related to the theme. 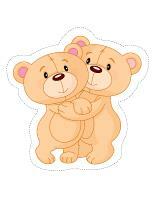 (Open circle bear) Print for each child. Have children cut out the circles and glue them on a piece of construction paper to represent a bear. The smaller circles can be used for ears and paws. The medium-sized circle can represent the head while the larger one can be used for the bear's tummy. Children can color their bear when they are done assembling it. Variation for younger children: Pre-cut the circles and provide a model they can follow or, if you prefer, simply let them glue the circles on a piece of construction paper in no particular fashion. 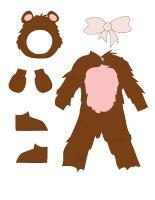 (Open my miniature bear) Print, color, and cut out the bear parts. Glue them on an empty toilet paper roll to represent a bear. You may also use a Styrofoam drinking glass or paper cup if you wish to make larger bears. 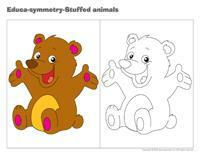 (Open coloring pages theme-Stuffed animals) Print for each child. (Open complete the drawing-Stuffed animals) Print for each child. Have children complete the picture by drawing the missing elements. 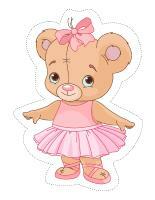 (Open I am learning to draw-A teddy bear) Print and laminate the model sheet. Encourage children to practice their drawing technique on the model sheet and try drawing a teddy bear on their own.